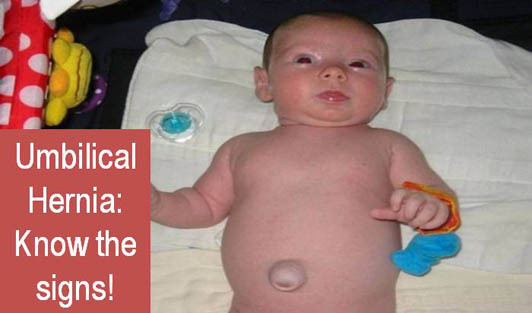 Umbilical Hernia: Know the signs! An umbilical hernia occurs when a part of the intestine protrudes through an opening in the abdominal muscles. It is a common and harmless condition that is often seen in infants, but it can affect adults as well. The umbilical cord passes through a small opening in the baby's abdominal muscle during pregnancy. This opening normally closes after birth, but if the muscles don't join together completely, it then weakens in the abdominal wall and may cause an umbilical hernia at birth or later in life. About 1 in every 10 infants is affected by umbilical hernia, also common in premature babies. In adults, it may be caused due to obesity, multiple pregnancies, and previous abdominal surgeries or due to fluid in the abdominal cavity. Often, the hernia looks like a lump in the navel, which may become more evident when the baby is crying, laughing, or even coughing. If you see a bulge in the navel and would like to know what it is. If the bulge is painful. If the bulge swells up and becomes discolored. If the infant or adult vomits and there is a bulge. A prompt diagnosis and treatment can help prevent complications!